VERY RARE SECOND GENERATION DIVER WATCH CIRCA 1968s, GOOD CONDITION. 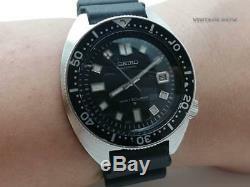 Seiko has been famous with producing its iconic diver timepiece since 1960s. Seiko has gone through lots of efforts and invention to design timepiece that suitable for water activities such as swimming or even diving. Of course, not only robust movement, but also designing the case that has the "Water Proof" capability. During this era, Swiss watchmaker such as Rolex, Omega, etc. Has already come out with many watches specially designed for diver. 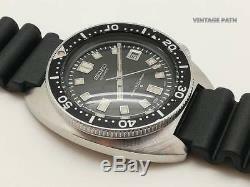 Finally, Seiko come out with its "so called" first generation diver, Seiko 6217 or 62 MAS in 1965 after the Tokyo Olympics in 1964. This was one of the iconic Seiko Diver that has been famous till today and with the story behind, Seiko has recently introduced the re-edition version of Seiko 62MAS. Seiko 6105 come with robust Seiko Caliber 6105A and the case has been changed to stronger bigger case with the crown move to 4 o? Clock position with a slight crown protection, hence when the crown is pressed down, it will slightly looks integrate with its watch case. It was called as'Deep Sea Diver' in the past. Note that it is still non screw down crown. The 6105 came in 2 type of case. Besides, both of these models came with luminous big hour markers and hands. The coin edge bezel is bidirectional with 60 clicks for full turn, which is quite tight and accurate and doesn't move easily. The purpose of this is to prevent the bezel accidentally moved during diving. 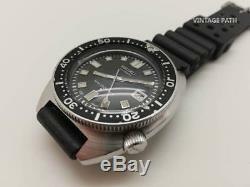 Seiko 6105 diver is also equipped with super thick double domed Hardlex crystal. Seiko invented its proprietary Hardlex crystal especially for its diver watch over the acrylic crystal because it is much more scratch resistant and doesn't shattered easily when knock into some hard materials. Besides, it comes with the "Proof" dial and "Proof" case back. Dial in good condition, especially the dial, is extremely difficult task as most of the dial has spoil due to water moisture during the usage in the past. We usually saw 6105 dial with a lot of blackish spots filling the area of luminous on the hour markers and hands. Marking on both the dial and case back in 100% genuine condition has gained the popularity nowadays and extremely sought after by Seiko collectors. 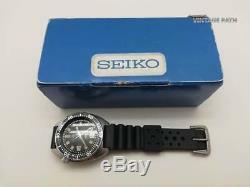 Especially, "Proof Dial" and "Water Proof" engraved case back version, which become one of the most sought after vintage Seiko Diver model today. To emphasize more, the 6105A caliber was also promised to be rugged and reliable movement and no wonders it become the choice of US military soldiers. Dimension: 41mm Diameter without crown. Case Lug to Lug Height: 48mm. Crystal: Thick SEIKO Domed Hardlex Crystal. 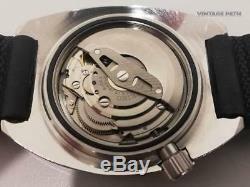 Movement: 6105A Automatic Winding 17 Jewels, Non-Hacking, Non-Hand winding, 21600Bph. Strap: Replacement Genuine Seiko Rubber Strap with Seiko signed buckle. For further details about every aspect of the watch, please refer to the high quality pictures attached carefully. It is a pre-owned watch but it is being preserved in pretty good condition. There is no such thing as a perfect for over 45 years pre-owned watch. The most important part is the condition is 100% genuine. Overall, the condition of this watch is quite decent despite the age. The stainless steel made thick case construction. Case still maintaining the genuine condition. The huge and thick cushion-shape designed case design allows this watch to have substantial wrist presence. The case lugs are also still maintaining the original factory sharpness. 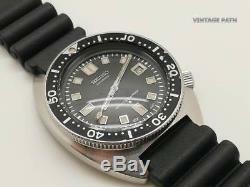 Genuine SEIKO 6105 Matte Black Dial is in good condition and remains untouched (NO Re-Dial, Re-Condition, or Re-Lume). Overall, the condition of the dial is pretty clean for almost half century age timepiece. No sign of water intrusion found. The large lume plots on each of the hour markers are currently in snow white color with some aging on the edges. May be due to the lume materials being used in the past, there are slightly some blackish color effect on some edges of lume plot, however they are considered quite clean and not conspicuous under human eye. Each of the square lume plots are surrounded by the polished chrome frames and their conditions are good as well. 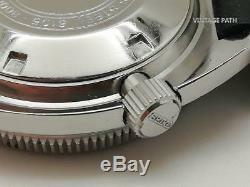 The minute track on the dial was also applied in Silver color and still maintains clear and crisp condition. 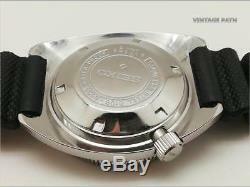 The dial read "SEIKO Automatic" with "Water 150m Proof" text, which is matching'Water Proof' case back. Please refer carefully to the high quality pictures attached. Genuine Hand Sets with matching lume with markers and bezel insert remains untouched (NO Re-condition or Re-lume) are in very good condition. The lume plots on the hands are quite clean but with some blackish effect on the edges of hour, minute, and second hands lume plot that might be due to the luminous material used in the past or due to the humidity of the environment. The unique "Traffic" light second hand is currently still in pale reddish color and pretty clean. Bezel and Insert are original. Overall, the Bezel Insert is in good state. There are some scratches found and some black paint has dropped, which due to the usage in the past, however the silver numbering on it are still clear and intact. Bezel rotation is bidirectional, accurate, and able to turn smooth as well. The silver anodized paint numbers are still very clear and crisp despite the age. The anodized effect is only available on genuine SEIKO bezel insert. A Automatic Movement, which is 17 jewels and running 21600 Bph. Overall, the condition of the movement is very clean. 6105A is the first generation of 6105 caliber. During the earlier time, it is Non-Hackable and Non-Handwinding, but it has the quickset date features. Currently, it functions well and runs smoothly though it is going to reach 50 years old. It is the proof that 6105 is indeed the reliable and robust movement ever made. Note: Back case gasket has already replaced with new one. Unlike the younger brother, 8110, the case is in symmetrical cushion style shape and made from solid stainless steel with no rust found on the case and case back. Condition is pretty good with some light scratches due to usage in the past. There are light nicks around the edges of the right hand part of the case. The case back engraving is still very clear and crisp with no noticeable deep scratches. Note: We didn't do any polishing or touch up on the case in order to keep the original condition of the vintage watch. Hardlex Dome Crystal with some hairlines scratches. It preserved well for such old vintage watch. The crystal is super thick that flat externally but it is much more "Dome" internally. The use of such thick crystal told us that SEIKO really designed the watch purposely to be strong and robust diver watch. To add on, the dome crystal effect makes the face of the watch looks truly work of arts. The silver applied minutes track on the dial will also looks interesting when being viewed from different angle of the crystal. Please refer carefully on the high quality pictures attached. Unlike its younger brother, the 8110, 8000 model of 6105 doesn't have the "Turn and Lock" feature. The crown does not have screwed down feature as well. It has the embossed "Seiko" word on the crown. Overall, the condition of the crown is very good and working perfectly. Genuine Seiko Replacement Rubber Strap. Is in good condition The quality of the strap is good, smooth, and very flexible to bend as well. This strap comes with the Original Seiko signed buckle. Time and Date Indicator display. It is automatic movement with date quick-set feature. It is Non-Hack-able and Non-Hand winding caliber. Condition is very good and running perfectly. Box From 1970's (Superb Condition). This box is the genuine. Series Diver Box and very rare available in good condition. As this is vintage watch, there is no guarantee for the watch being waterproof. Please review all the pictures carefully. We will reply to you very soon. We are watch enthusiast and not an authorized dealer for any company. 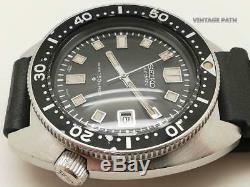 The item "SEIKO DIVER 6105-8000 (SUPER RARE) VINTAGE WATCH FOR MEN CIRCA 1968s, GOOD COND" is in sale since Sunday, November 4, 2018. This item is in the category "Jewelry & Watches\Watches, Parts & Accessories\Wristwatches". The seller is "vintage_path" and is located in Singapore. This item can be shipped worldwide.